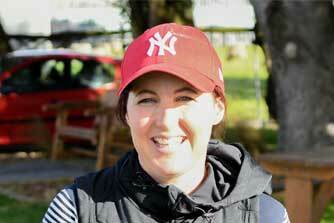 Their training operation, the southern-most in the country, has already put seven wins on the board and sits second only to Phil Williamson on the table of trainers based south of the Waitaki River. So, not surprisingly, the $30,000 Macca Lodge ‘Trained South Of The Waitaki’ mobile 1980 at Addington on Show Day will be a major target for them. Representing the stable will be Mach’s Back, bred and owned by local lawyer and prominent administrator Murray Little. He also supplies the premises at Oreti Beach south of Invercargill which makes up the main base for Barclay and Ellis. Mach’s Back is the son of Dream Angel, older full-sister to the near $900,000 earner One Dream. He resumed at Invercargill last week and Barclay is pleased with his progress since. The four-year-old went straight to the front at Ascot Park and set up a track record-equalling pace, succumbing late to Kilowatt Kid. Time for the trip of 2:39.6 equalled the track record for male pacers set in April 2017 by Mongolian Hero. Kilowatt Kidd, along with the third and fourth place-getters Young Conqueror and Please Shuddup, are other leading nominees for the Addington feature. Barclay recognises they’ll be threats again but reckons with the right run, Mach’s Back is a top chance. “The distance is right up his alley, he’s best doing his own thing in front and with the right draw should be able to set the race up,” Barclay said. Although Mach’s Back is among the top seven rated nominees for the race, only three have less winning stakes. Under the preferential barrier draw, this leaves the gelding well-placed to gain a more favourable marble than his major opponents. And when you add in the services of Ricky May, the confidence levels only rise. Mach’s Back was given a workout at Winton on Friday to top off his preparation for the race and although a lot wasn’t asked of him, he finished close up to the winner, Flash Party. Also at the Workouts were Wee Man Trouble, a winner for Ellis in a mobile trot at Addington in June and nominated for a mobile 1980-metre trot on Show Day. The four-year-old resumed at Ascot Park last week but broke soon after the start of the stand-start event. Nathan Williamson has been engaged to drive. Completing the Barclay-Ellis line-up at Addington is Shezacullengirl, placed on the course in July and knocking on the door her past three in the south. She has a second line draw in the fifth on Tuesday and will also have the services of May. Shezacullengirl is raced by Little’s company Havtime Breeding Limited, along with his cousin Malcolm Little and Malcolm’s wife Sarndra. The same owners also race promising filly Havtime, winner of the Yearling Sales Two-year-old Fillies Final from the stable of Barry Purdon at Alexandra Park in May and she resumes at the Pukekohe workouts on Saturday.